Author’s full name and academic title(s). An abstract (100-150 words) to disclose the main idea of the paper and your research results). brief summary on the positive and negative methodological experience: testing of methodological tools, difficulties in the implementation of the initial research concept, discovery of the problems with the methodological tools, unpredictable organizational and methodical situations. "This research received no specific grant from any funding agency in the public, commercial, or not-for-profit sectors. books: surname, initials, (year), title, place of publication, publisher. E.g. Marfleet, P. (2006), Refugees in a Global Era, Hampshire and New York: Palgrave McMilian. journals: surname, initials, (year), "title", journal, volume, number, pages. E.g.Guarnizo, L.E. (2003), The Economics of Transnational Living, International Migration Review, Vol. 37, no. 3, pp. 666-699. Internet sources: World Bank 2009 Outlook for Remittance Flows 2009-2011 // http://econ.worldbank.org (referred on 30/09/2009). 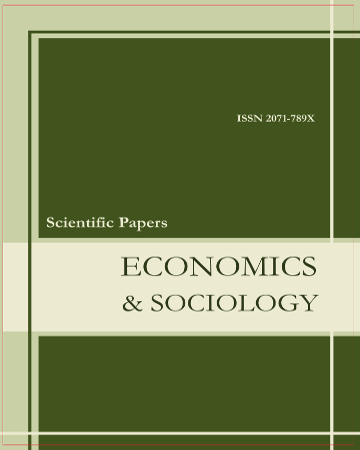 The Editorial Board of “Economics and Sociology” follows the rules on academic writing and academic ethics, according to the work by Miguel Roig (2003, 2006) “Avoiding plagiarism, self-plagiarism, and other questionable writing practices: A guide to ethical writing”, available online at http://www.cse.msu.edu/~alexliu/plagiarism.pdf/. The Editorial Board suggests to potential contributors of the journal, reviewers and readers to dully follow this guidance in order to avoid misconceptions in academic writing. Editors will blind referee all manuscripts as will reviewers, to the guidelines explicitly highlighted by COPE http://publicationethics.org .